Outdoor kitchens and cooking areas are an excellent way to extend your backyard living space and make it more enjoyable and suitable for entertaining. A beautifully designed and built outdoor cooking area also has that “wow” factor and really makes your backyard look even more fun and luxurious. Whether you love to entertain family and friends, or you’d really just like to have your own personal poolside retreat an outdoor kitchen will improve your quality of life. Lonestar Home Solutions is a home remodeling contractor based out of Seguin, Texas that specializes in designing and building beautiful outdoor patios with cooking areas. 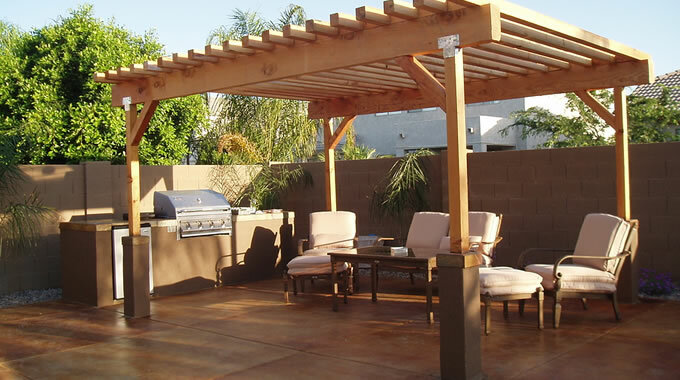 We design and build outdoor kitchens, patios, fireplaces, pergolas, gazebos and more. From a simple backyard kitchen beside your pool to completely transforming your backyard patio into an awesome spot for parties and entertainment, we can help you transform your backyard patio ideas into a reality. For many homeowners who’ve never designed an outdoor kitchen it can be a confusing process with all of the decisions you’ll need to make. From running gas, water and electricity to landscaping and appearance decisions right down to size, shape, layout and the specific appliances you’ll be installing. There is a lot of considerations to make and it’s going to be a unique project for every property. Look at magazines, look at websites, watch home remodeling shows, get as many ideas as you can. When it comes to actually designing the patio your ideas can be incorporated into a 3D drawing and from there, changes can be made until you’re happy with the final layout and design. Now it’s time to build! Why Choose Lonestar Home Solutions To Build Your Outdoor Kitchen? Over the years we’ve helped design and build many outdoor cooking areas in the Seguin area. We are familiar with the latest design trends, stay current on the latest building materials and are continually striving to make our customers experience with their home remodeling project a great one. When you choose Lonestar Home Solutions you’re not just getting another contractor. You’re partnering with a team of professionals, dedicated to making your home a better place.